You can chop both the almonds and the orange peel separately in a food processor by pulsing them to fine pieces. Add 1 tablespoon flour to the orange peel when processing to keep the pieces from sticking together. Mix just until almonds and orange peel are incorporated. Chill dough 3 to 4 hours. Preheat oven to 350 degrees. Roll dough out on a lightly floured counter to 1/4 inch thickness and cut with your favorite Ann Clark Ltd cookie cutters, then transfer cookies onto cookie sheets that have been lined with parchment paper or silicone liners. Bake 8 to 10 minutes, until lightly colored. Let cookies cool slightly on cookie sheets, then transfer to a wire rack to cool completely. Melt 6 ounces of semisweet or bittersweet chocolate and spread onto bottoms of cookies. 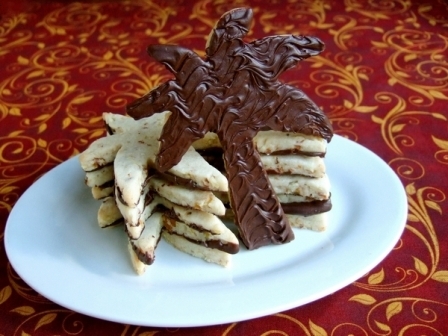 If desired, use a fork or a cake comb to draw a wavy pattern through the chocolate. Place the cookies on a wire rack, chocolate-side up, until the chocolate is set.